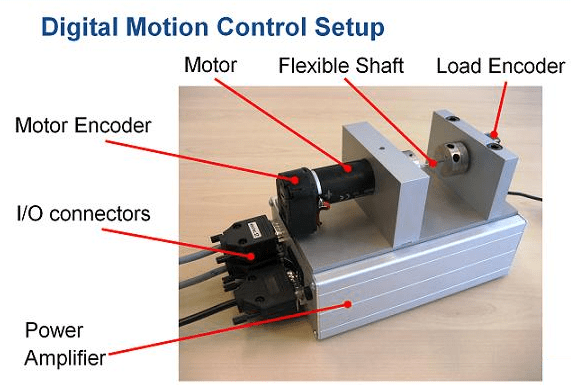 This example shows how to use Control System Toolbox™ to tune a digital motion control system. The motion system under consideration is shown below. This device could be part of some production machine and is intended to move some load (a gripper, a tool, a nozzle, or anything else that you can imagine) from one angular position to another and back again. This task is part of the "production cycle" that has to be completed to create each product or batch of products. The "Tunable Digital Controller" consists of a gain in series with a lead/lag controller. We are seeking a 0.5 second response time to a step command in angular position with minimum overshoot. This corresponds to a target bandwidth of approximately 5 rad/s. The looptune command offers a convenient way to tune fixed-structure compensators like the one in this application. 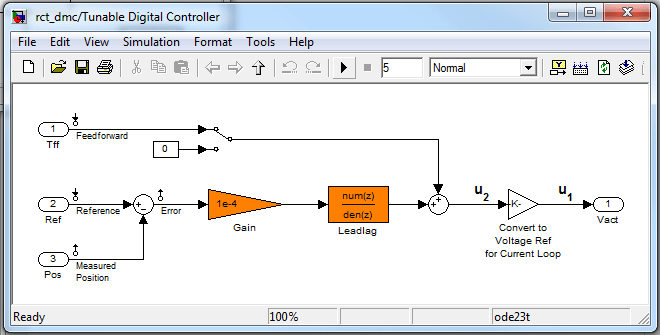 To use looptune, first instantiate the slTuner interface to automatically acquire the control structure from Simulink. 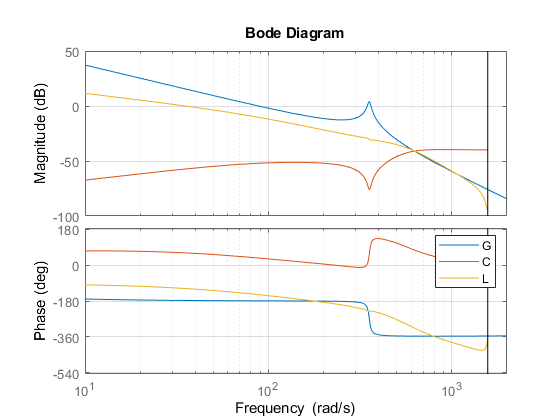 Note that the signals of interest are already marked as Linear Analysis Points in the Simulink model. To validate the design, use the slTuner interface to quickly access the closed-loop transfer functions of interest and compare the responses before and after tuning. The tuned response has significantly less overshoot and satisfies the response time requirement. 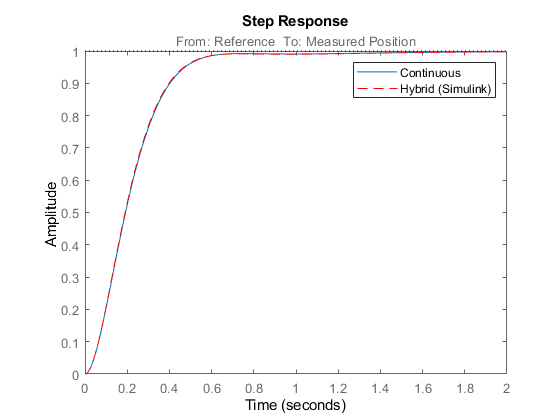 However these simulations are obtained using a continuous-time lead/lag compensator (looptune operates in continuous time) so we need to further validate the design in Simulink using a digital implementation of the lead/lag compensator. 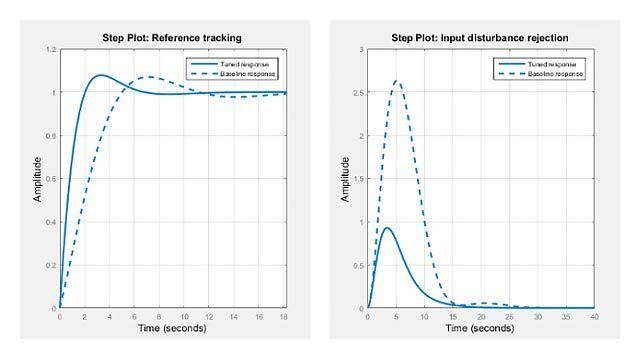 Use writeBlockValue to apply the tuned values to the Simulink model and automatically discretize the lead/lag compensator to the rate specified in Simulink. The simulations closely match and the coefficients of the digital lead/lag can be read from the "Leadlag" block in Simulink. Next try to increase the control bandwidth from 5 to 50 rad/s. Because of the plant resonance near 350 rad/s, the lead/lag compensator is no longer sufficient to get adequate stability margins and small overshoot. One remedy is to add a notch filter as shown in Figure 3. To tune this modified control architecture, create an slTuner instance with the three tunable blocks. Then associate this parametric notch model with the "Notch" block in the Simulink model. Because the control system is tuned in the continuous time, you can use a continuous-time parameterization of the notch filter even though the "Notch" block itself is discrete. 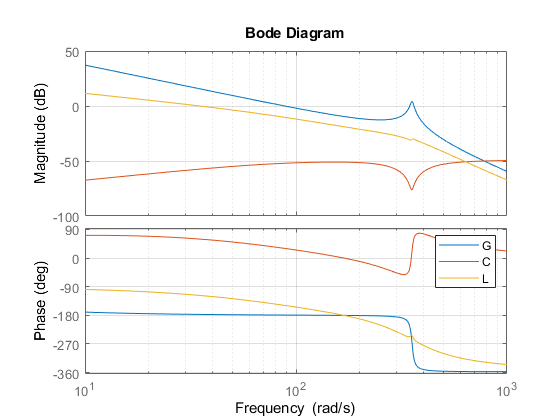 Next use looptune to jointly tune the "Gain", "Leadlag", and "Notch" blocks with a 50 rad/s target crossover frequency. To eliminate residual oscillations from the plant resonance, specify a target loop shape with a -40 dB/decade roll-off past 50 rad/s. The final gain is close to 1, indicating that all requirements are met. 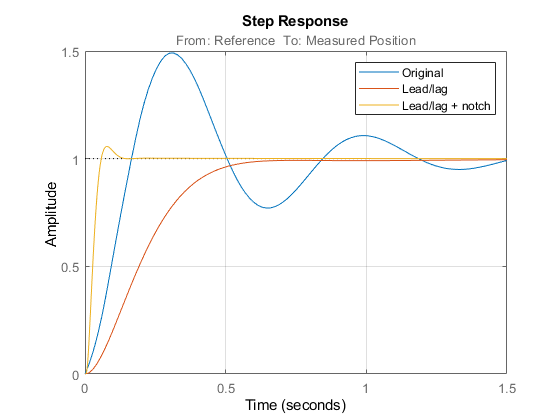 Compare the closed-loop step response with the previous designs. 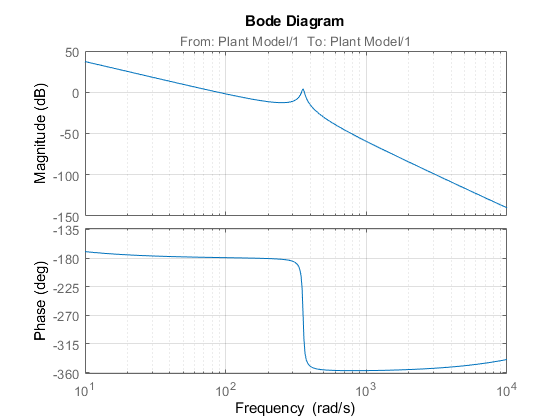 This Bode plot confirms that the plant resonance has been correctly "notched out." 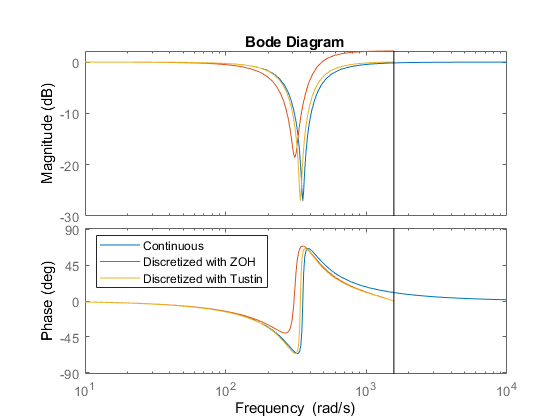 writeBlockValue now uses Tustin prewarped at the notch frequency to discretize the notch filter and write it back to Simulink. Verify that this gets rid of the oscillations. To prevent high-gain control and saturations, add a requirement that limits the gain from reference to control signal (output of Notch block). 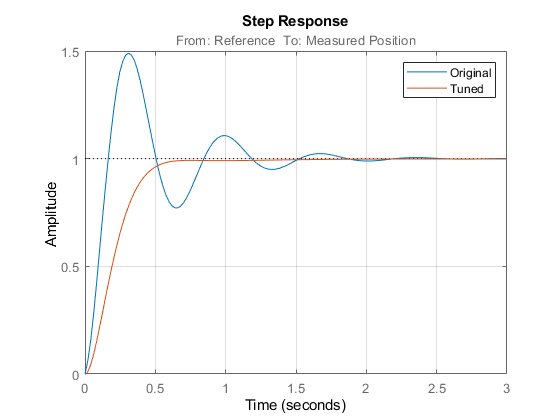 Now retune the controller at the specified sampling rate and verify the tuned open- and closed-loop responses. 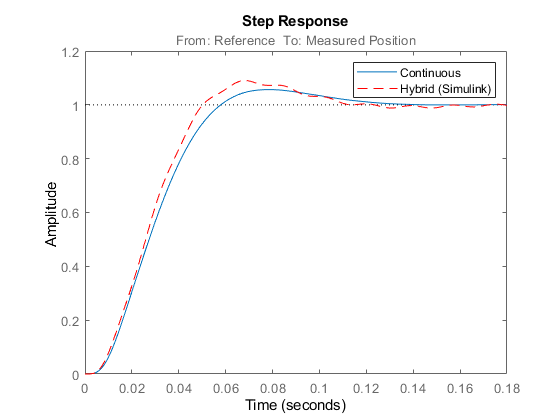 The results are similar to those obtained when tuning the controller in continuous time. 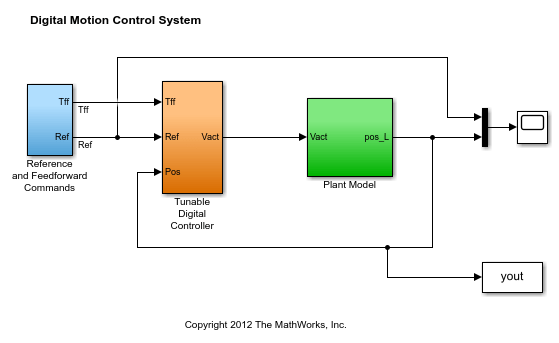 Now validate the digital controller against the continuous-time plant in Simulink. This time, the hybrid response closely matches its discrete-time approximation and no further adjustment of the notch filter is required.